I bought my first Ford Mustang when I graduated from high school and another when I graduated from college. I live in Michigan. On paper you drive for a year Mustang and Michigan winter do not mix, but I survive. I had only two miles away and others on which I had traveled 74 miles to get to work. 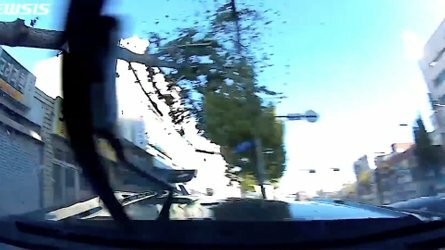 You see, the problem is not the Mustang, but the drivers behind the wheel – like the driver in the video above. The video is scary. No race is worth so much stupid and dangerous driving. The Mustang roars through the streets of Seoul and illuminates at least four red traffic lights. At an intersection, the Mustang must maneuver through the traffic. The Mustang missiles are ahead and illuminate several red lights. The Mustang avoids meeting a pedestrian crossing the street. The driver then roars past a stopped bus at high speed. Everything stops when the driver tries to drive around a moped. The driver accelerates through the train, losing control of the Mustang. The car slides into a separation fence before it is thrown out and pushed into a tree. The Mustang jumps off the curb and knocks down a parked motorcycle. The impact is so hard that the tree falls on the sidewalk. Fortunately, no one was on the sidewalk at the time of the crash, and the audio data left the inmates unharmed – or at least slain and injured. The video description states that the Mustang ran a race Mercedes-AMG A45 and both achieved speeds of up to 109 miles per hour (177 kilometers per hour). The section of Seoul they drove through had a top speed of 60 km / h. That is downright dangerous. I hope both drivers learn to keep such antics on the track.